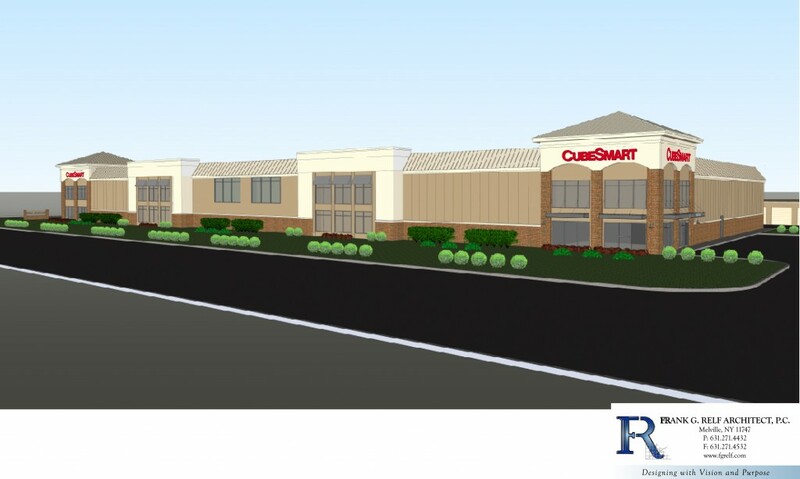 Construction is well underway for the Cube Smart Storage Facility on the north side of Rt 25 in Middle Island, just west of the MIFD Substation 2, on the eastern corner of Tudor Lane. The above renderings give details for the project. Until recently, this property was owned by Competition Toyota, which had planned and been approved for a new service center at the location several years ago. When the global economy changed those plans, Competition sold their Middle Island business and this land across from it. New owner Charles Lefkowitz, a former TOB Councilman who also owns the CAMCO Property Management firm, initially floated the possibility of a Chik-Fil-A at this site. That certainly got MICA’s attention! When that deal fell through, this alternative emerged and was first mentioned at our October 2016 MICA meeting. The site plan retains some of the original Toyota features: the main building is close to the street with a reduced setback, parking is to the side and rear, there is a nice street landscape plan and a buffer to the rear. The designers feel it does not really look like a typical storage unit from the front; though we note there will be some garage door units in the rear building, perhaps the best and certainly less visible location for these. Access to parking and the storage units will be through a secure key code system, with one egress on RT 25 and two on Tudor Lane. Cube Smart officials claim these projects generate very little traffic and, of course, absolutely no additional schoolchildren, making it quite tax positive. One major objection voiced when MICA members reviewed these plans in detail at our February 2017 meeting was: “But it’s NOT a restaurant!” An understandable disappointment, which we will strive to resolve elsewhere. Another major member concern involved the eviction process for delinquent storage unit renters. We are all too familiar with the heartbreaking and often disgusting method of residential evictions on display on a regular basis, wherein a home’s contents are simply piled curbside and left to be ransacked by vulture-like passersby until the Town of Brookhaven can remove the resultant debris. We have been assured that this will NEVER be the process at this storage facility, as the owner/operator is fully responsible for removal and disposal of abandoned contents as outlined in all rental agreements. As longtime members know, MICA rarely rejects proposals without first listening and learning about them. We generally try to influence and shape those projects that come before us. To that end, we suggested that a red brick facade, similar to that of the nearby MIFD Substation 2, would be an excellent way to help this facility blend in better with our Main Street. 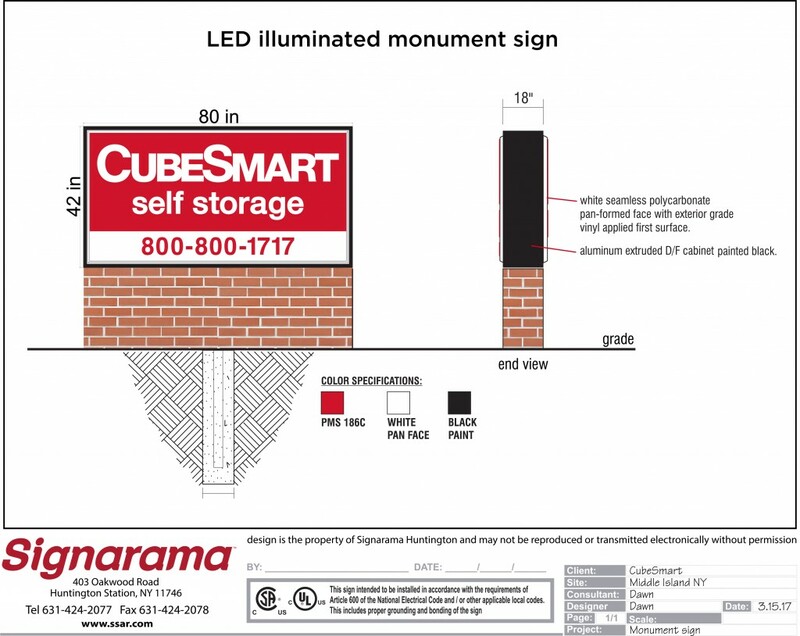 This material will indeed be used on the lower portion of the building, and we await an updated rendering showing this (red brick is clearly visible in the monument sign plan). We also asked that no pvc panel fencing be used, explaining that these panels tend to get kicked out by pranksters, tagged with graffiti, or both. Faux wrought iron, originally proposed for the front portion only, will now be used throughout most of the project. All lighting will be Dark Sky compliant. Space for a future bus shelter will be retained, and disturbed areas will be revegetated with native plantings in accordance with NYS Pine Barrens regulations. 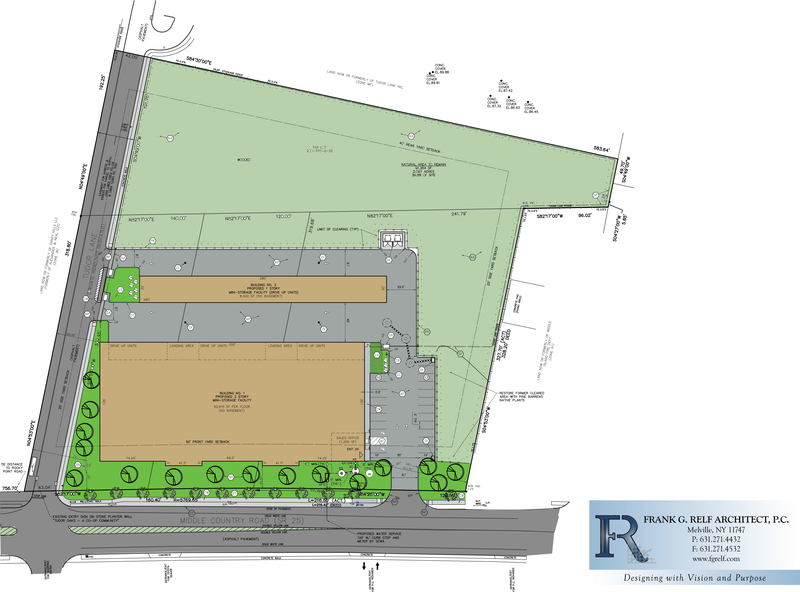 No Change of Zone was needed, but this project required several variances, which were sought by the developer and representatives at the April 19th, 2017 Public Hearing before the Town of Brookhaven’s Board of Zoning Appeals. The MICA Executive Board met prior to this to determine the nature and details of our testimony regarding these requests. The most onerous of the variances, to remove topsoil, was withdrawn at the hearing; the others, regarding square footage/placement/numbers of various signs, reduced set backs and landscaping requirements, and increased floor area ratio, were granted unanimously. MICA President Gail Lynch-Bailey devoted much of her testimony to plead for a restaurant in Middle Island, asking both the Zoning Board members and the television viewing public to contact MICA if they knew of any interested restauranteurs. She also acknowledged the developer’s upgrade of the brick facade and fencing materials per the civic’s request, as well as the low impact of the project in terms of traffic, noise, litter and burden to the school district.